Ferns – Multiple exposure with spin to highlight patterns and texture. What does interpretive nature photography mean? Nature is nature, art is art, and never the two shall meet, right? For some, perhaps this is true. But only for those who have never walked in the woods, sat in a flower garden or watched the sun meet the day or settle in for the night. Or for those who have never stopped long enough to explore a dandelion or to watch a butterfly break free of its chrysalis. Nature IS art, in its finest and purest form. Capturing this essence is what nature photographers live for. It is what makes us unable to imagine doing anything else. It is what brings me peace, healing and joy. It is what pushes me as an individual to be present in the moment and to slow down long enough to see and feel and connect. A Metallic Green Bee (Augochloropsis metallica) visits a Black-eyed Susan. Since Niall Benvie and I first developed Meet Your Neighbours in 2009 I’ve seen my fair share of amazing, beautiful and sometimes bizarre creatures. From the beginning, I’ve worked almost exclusively in the land that surrounds my home near the Southern Appalachians in upstate South Carolina, USA. Rather naïvely, I suspected that after a short period of time I would begin to run out of subjects to photograph but nothing could be further from the truth. Seldom does a day go by that I don’t see a creature or plant that I’ve never seen before in the wild, anywhere! As Piotr Naskrecki points out in his fantastic book The Smaller Majority, “Over 99% of life on Earth is smaller than your finger.” It’s little wonder then that the careful observer will be awarded with a lifetime of discovery. Another rainy night rolls into the early morning hours, and I anticipate the end of the storm as the sunlight begins to break through the clouds. It is about 7:30am and the first glimpse of light beams through the thick blanket above. As it reaches ground level, the light reflects off of the colorful flowers in my garden, creating the most beautiful sparkling bed of jewels. 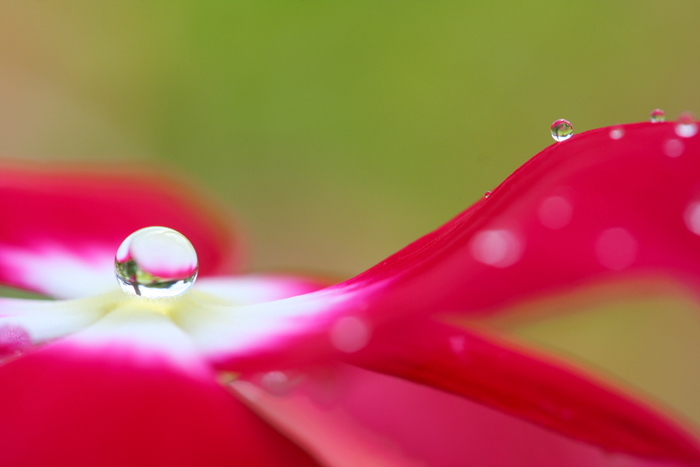 Each time this happens, I am inspired to grab my macro lens and my tripod and head outdoors for a photo shoot.